Cities provide habitats for over half the worlds population and this is expected to increase to 70% by 2050 (United Nations, 2007). Coinciding with this growth is the increasing use of information communication technologies (ICTs) such as mobile phones, wireless networks, Global Positioning Systems (GPS), and web based services in our personal and professional activities. Such technology is changing our daily lives, not only in the way we communicate and interact with each other or share information but also how we view the city. Urban informatics research has evolved to explore this change. It is concerned with the impact of technology, systems and infrastructure on people in urban the environment. It draws researchers together from a broad spectrum of academic communities. For example, the social (media studies, cultural studies etc.) 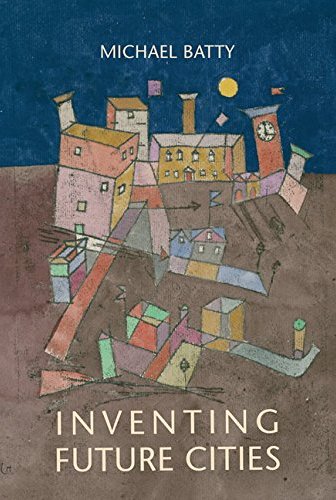 the urban (urban studies, urban planning, etc.) and the technical (computer science, software design human-computer interaction etc.) and focuses attention on the opportunities and problems of such ubiquitous computing. 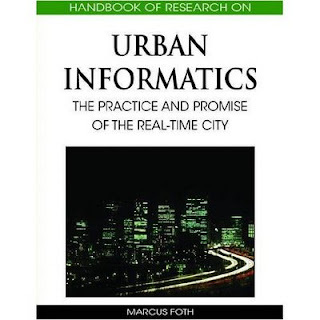 Marcus Foth in this edited book entitled “Handbook of Research on Urban Informatics: The Practice and Promise of the Real-Time City” brings together in 29 chapters on recent research and development in the field of urban informatics from around the world. The book covers a plethora of topics including; community engagement, digital cities, digital identities, locative media, mobile and wireless applications, participatory planning, personal privacy, surveillance and sustainability. The book is spilt into six parts, the first part introduces urban informatics and highlights it diverse application areas, including how people are adapting to such digital technologies and how they are impacting on urban dynamics. Section two explores who is participating and how ICTs are being used. Questions addressed include why people join online communities, its use for community planning, how such technologies can trigger or sustain civic participation or how ICTs can be used in public spaces for collective expression through large screen interactive projections. The third section explores how one can engage urban communities through the use of ICTs and enable the communication of information and interaction between people in the city. For example, location based media accessed through GPS enabled devices. Section four discusses how ICTs can impact on location, navigation and space such as studying online social networks along-side their real world counterparts. How augmented maps can aid car navigation or how virtual cities can be used as a test-bed for examining the design of urban public spaces through the use of agent-based modelling. Section five discusses the development of wireless and the mobile cultures and how such technologies impact on our daily lives and activities both at home and in the city including the development of community wireless networks and how mobile phone use in urban cultures are reducing the need for premade plans. The final section explores how ubiquitous and pervasive computing might develop and be used in the future, not only how it can advance urban functions but also its potential problems. For example, the increasing deployment of sensors and electronic devices within the transport network will allow for real time access to route planning thus avoiding congested areas. For the citizen of a city, the development of ICTs will encourage greater mobility for or be used to coordinate social action such as protests (see Justo, 2004). ICTs could also be used as a tool for collective problem solving but such technology will also challenge existing social structures and potentially distance people from more traditional face to face contact. In summary, the book pulls together a diverse literature of ICTs, how they are used throughout the world. 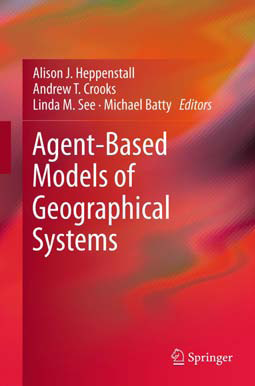 The chapters range from critical reflections on who is using the technology and how, to more technical applications. The chapters are mostly well written and referenced. Each chapter has a key terms section which is extremely useful in understanding each chapter. The chapters are mostly well written. My only criticisms of the book are the quality of the images (they are all black and white) while some of the text refers to them in colour and the cost at $265. Nevertheless, it does provide a useful resource for social and computer scientists. 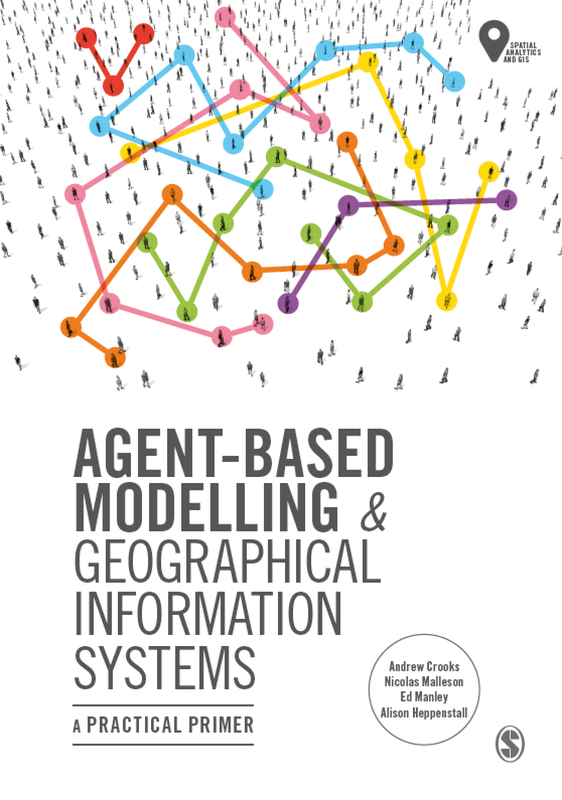 In relation to my own research, I am interested in how such technologies can be utilised for the creation of agent-based models and thus providing a greater understanding of cities and their inhabitants. Justo, P D, 2004, Protests Powered by Cellphone, The New York Times (September 9th). United Nations, 2007, World Urbanization Prospects: The 2007 Revision, Department of Economic and Social Affairs: Population Division, New York, NY.